A few weeks ago I was able to finish converting my youngest child’s nursery into a big boy room/guest room, suitable for a wildly independent two year old and the occasional houseguest. The conversion has taken a bit longer than I planned, but that’s due more to my reluctance to admit that we’re ready to move the baby bed to the attic than the actual amount of work that was done in the room. You all asked for additional photos of the vintage crib, so I’ll indulge both your curiosity and my sentimental heart with these final photos of a family heirloom that has nurtured three generations of sweet, sleeping infants. 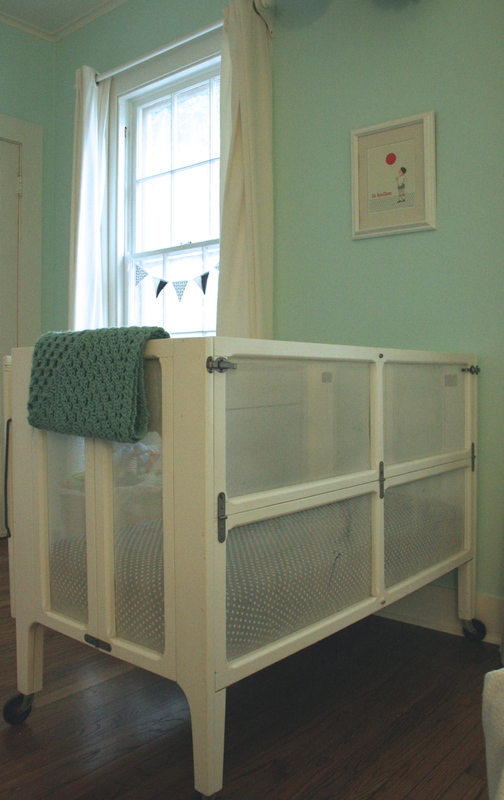 This side latches and folds down making it easy for adults to get baby in and out of the bed, but nearly impossible for a toddler to unlatch both ends at the same time. Yes, that is screen between the wood frame. This is the “lid” (for lack of a better word) that folds over the top and latches. We never used it, but the idea of screening your child in their crib actually makes pretty good sense to this Southern Mama who enjoys the outdoors but detests mosquitos. Judging by the vintage advertisement below, that’s exactly what the Trimble Company was banking on. 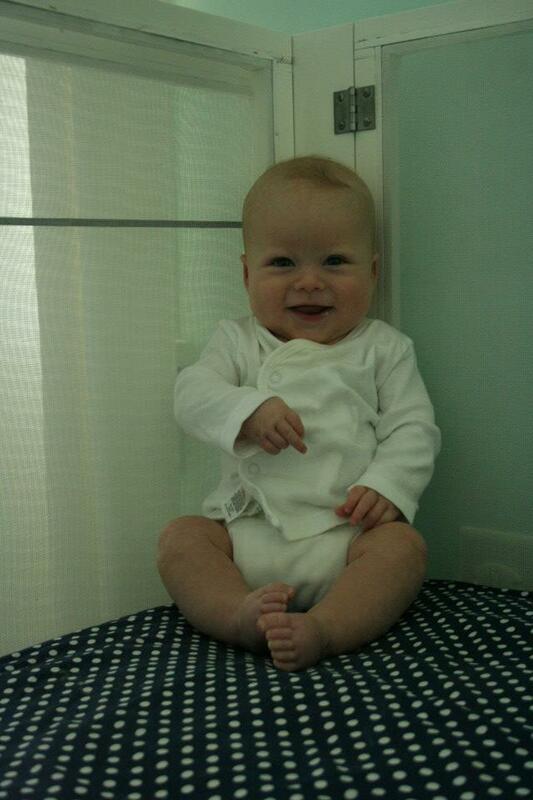 As you can see, my child thought his crib was a pretty novel idea, too! I will not lie, even after rearranging the room, I left the crib sitting awkwardly in the middle between the bed and the chair, obviously out of use and out of place, but not quite ready to store it away for good. However, this past week, my husband finally hauled it up to the attic, and we decided to fully embrace the “little boy” years. He’s ready and so are we! 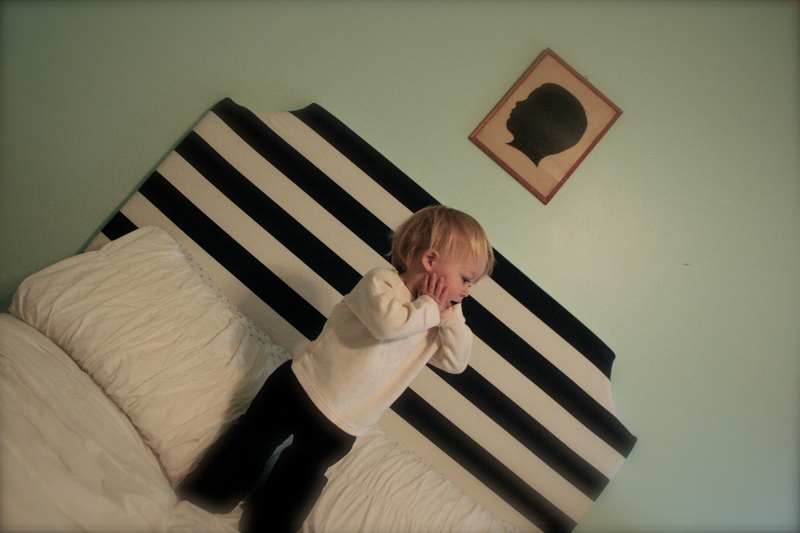 I wanted to keep a hint of the “sweetness”of P’s nursery in his updated space. He is a sweet child and a calm and pleasant room suits him well. Like any good mother on a mission to clean up and clean out, I chose to tackle the closet first. Cleaning out the baby things was the difficult part. The actual conversion was simple. 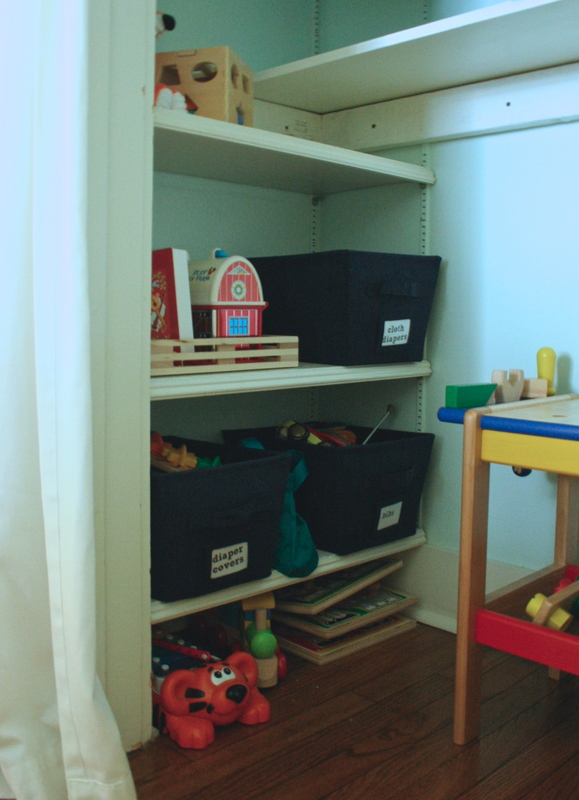 I simply lifted off the front half of the changing table that my husband installed, moved the hanging rod from the bottom bracket to the top, moved the baskets to the top shelves, and adjusted the side shelving to accomodate toys. Toys are kid-accessible and clothes are not. You like how I planned that, no? I lowered the adjustable shelves are repurposed baskets (oops! forgot to re-label) to make room for toys. The center and right sides of the closet store larger toys that I’d rather not have displayed in the room. He can actually play with his tools inside the closet! Looking up to the top of the closet. Plenty of room for several seasons of hanging clothes as well as two shelves of bins and baskets. 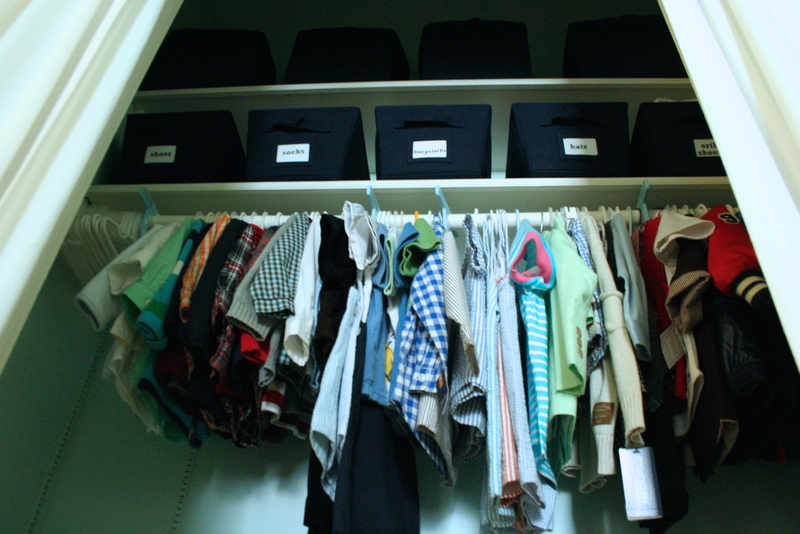 Having an organized and functional closet for my kids makes mornings easier and cleanup time bearable. 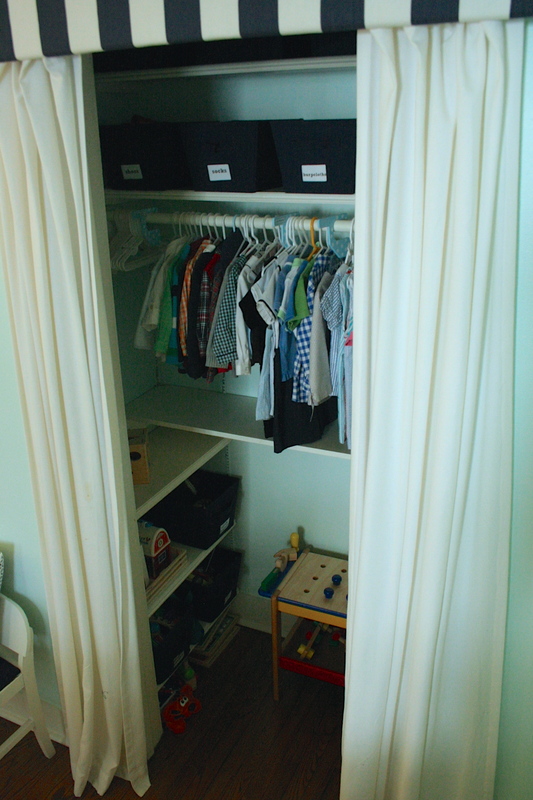 The little one is loving his new closet. He feels like the big boy that he is by being able to choose his toys and put them back by himself. 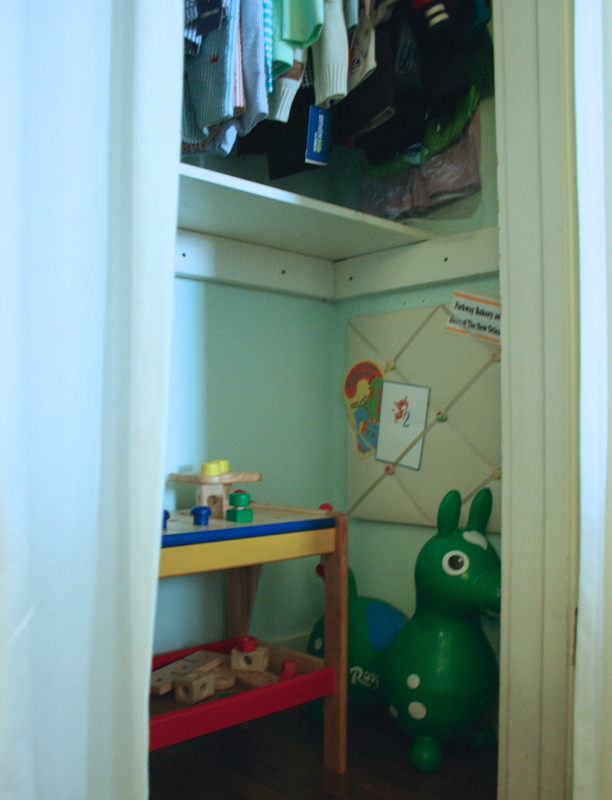 I consider it a winning design when a closet can aid in teaching kids to have fun and be responsible for their things. In the next few days, I’ll post more about changes to the rest of the room, but here are few glimpses of the fun! Is this kidddie koop considered safe? I mean does it meet regulations. I have the one that my mother used for her children and I used it for our 4 children. I still have it and it is in great shape…with a coat of fresh paint and a new mattress, it would be lovely for my daughter who is due in late July. Hi Sharon! Great question, and one that we considered before deciding to use the crib for our kids. 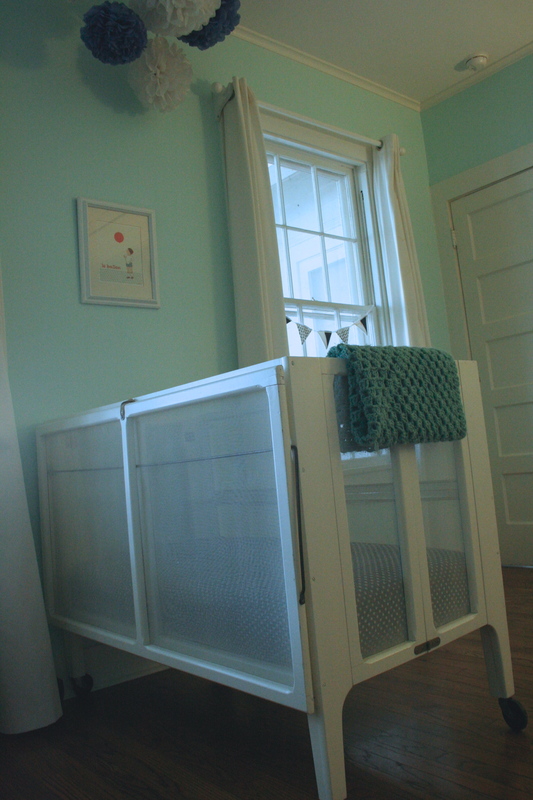 To my knowledge, current crib safety standards focus on cribs with side rails rather than a solid screen side wall, so its hard to apply them to the kiddie koop. I would encourage you and your daughter to think through the intent behind current regulations – little heads not getting stuck between rails, fingers not getting pinched, toddlers not falling over the side – and then decide if you feel safe using the kiddie koop. We put the mattress at the lowest level, had the crib sanded, repainted, and re-screened, and all the hardware cleaned and reinstalled securely. I found it virtually impossible for my kids to crawl out (nothing to step up on) or unlatch themselves due to the width and type of latch. We would not have used the crib if we felt it was unsafe and would have purchased a new one if we noticed safety issues while using it. Both of my boys used the crib until they moved to a big boy bed at around age 2 and it’s still in sturdy condition. Hope this helps you and your daughter make a decision that you feel comfortable with – would love to know what you decide. Congratulations!